Kingston Accommodation Partners is working with Tourism Kingston and the City of Kingston to move forward with a Municipal Hotel Tax model. The three parties are looking at a 4% + HST hotel tax to stay with industry standard. This Municipal Hotel Tax would not only include current KAP accommodators but non KAP accommodations as well. The end result would be a revenue stream to support further destination marketing efforts, stronger product development support and support of the marketing and sales efforts of Tourism Kingston. How much is the Municipal Accommodation Tax? The Municipal Accommodation Tax is 4% + HST and must be applied to accommodations provided for a continuous period of 30 days or less. The tax is applied to only the accommodation and should not be applied to other fees such as valet parking, laundry service, continental breakfast etc. The Municipal Accommodation Tax is a mandatory tax and must be paid to the accommodation operator at the time of pre-paid booking or check out. Under what authority does the provider have to charge/collect the Municipal Accommodation Tax? The City of Kingston has enacted a municipal bylaw that allows the City to impose the Municipal Accommodation Tax on the purchase of transient accommodations of 4% plus HST which is remitted to Kingston Accommodation Partners on a monthly basis. Are any guests exempt from the Municipal Accommodation Tax? Are any hotels charges exempt from the Municipal Accommodation Tax? Fees such as valet parking, laundry service, continental breakfast, etc. Does the Municipal Accommodation Tax get applied to the rental of a hotel’s boardroom or banquet room? No. The tax is only applied to a room that is being used for accommodation. However, the tax is exempt when a room that may or may not contain a bed is being used for displaying merchandise, holding meetings, or entertaining and not being used for accommodation. How do I remit the tax that I collected? The MAT will be remitted to KAP by way of cheque or EFT by the 20th of the following month. For Electronic Fund Transfer, please contact our office for the banking information. When do I start collecting the tax? August 1st, 2018. 4% plus HST on all room stays less than 30 days. What is the amount of the municipal accommodation tax? The Municipal Accommodation Tax rate will be 4% + HST and must be applied to accommodations provided for a continuous period of 30 days or less. How is it applied to the cost of renting a hotel room? The 4% HST is applied to the cost of only the accommodation of a continuous period of 30 days or less and should not be applied to other fees such as valet parking, laundry service, continental breakfast etc. Why do I have to pay this tax? The Municipal Accommodation Tax is a mandatory tax imposed by Kingston City Council and will appear on the bill upon check out. Can I refuse to pay this tax? Is this a mandatory or voluntary tax? No, you cannot refuse to pay this tax. The Municipal Accommodation Tax is mandatory and must be paid to the accommodation operator at the same time that you pay for the booking or upon check out. What happens with the funds generated through the Municipal Accommodation Tax? 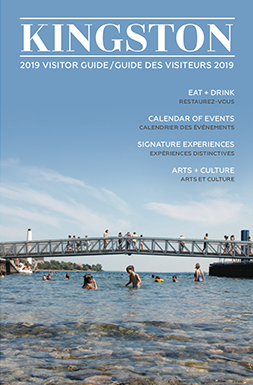 Funds generated through the Municipal Accommodation Tax will be invested in destination marketing, sales, and product development in Kingston.